Did you ever wonder what to do with your fruit salad leftovers or how to keep your fruit salad fresh a bit longer? Well in the following article Heather Haxo Philips of ” Raw Bay Area”, shares with us 3 practical ways to use and preserve our fresh fruity concoctions. In just a few simple steps Heather will share with you how to transform your ordinary fruit salad into tangy, probiotic rich fruit condiments and meals. Check out Heather’s website and sign up for her newsletter to get great ideas, recipes and pearls of raw food wisdom. Last month I introduced many tasty, unique ways to present seasonal fruit. Here is another unique idea – actually three. Adjust ingredients depending on your farmer’s market bargains and what is growing in your garden! Last week I went camping with a bunch of friends. After breakfast we had more than a gallon of fruit salad left over. Being the gal that I am, I refused to compost the delicious fruit. I had to ferment it! It turned out great. Put your leftover fruit salad in a plastic bucket (food-grade) or glass jar with a wide mouth. Make a solution of water or honey in water**. Pour your sweet solution over the fruit salad and mix. Don’t seal the jar, but keep it covered with a fabric so flies don’t get in. Stir several times a day until the salad becomes bubbly. It will take 1 – 3 days for this to happen. It may even start to foam and that is ok. That means it has fermented! You can just keep eating the salad until it is all gone. Or seal the jar and store it in the fridge as you eat it. This fermented fruit salad is great as a chutney or as topping on ice cream, (pound) cake, scones, waffles, or pancakes. Whatever! Why eat fermented fruit salad? My top 7 reasons: It is yummy. It is a different twist on the basic and boring fruit salad. It preserves fruit that might rot or get thrown away. It improves your immune system. It gives you an added Vitamin C boost. It might just strengthen your gut, helping you to digest and assimilate your nutrients. It travels nicely, not needing refrigeration. Germans are great fermenters. They even have a name for this fruity-fermenty dish. Called rumtopf, it is the same recipe as above BUT it also includes rum. 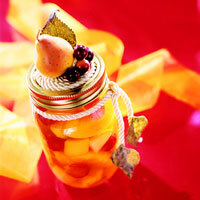 The fruit, sugar and rum is a layered (not stirred) mixture that is started in spring/summer when fruits ripen. It is traditionally harvested/eaten at Christmas time. Store in the fridge or another cool place till winter time or hunger sets it. But, I couldn’t wait that long. And I had a lot of fruit salad. So, I made my fermented fruit salad into granola. I put about 3 cups of fermented fruit salad into the blender with 1/2 cup of pitted and soaked dates, plus a pinch of salt and stevia. I blended this into a syrup. Then, I dumped the syrup into a bowl with about 3 cups of soaked buckwheat, 1 cup chopped almonds (soaked and dehydrated) 1 cup sesame seeds, 1/2 cup goji berries and some finely cut dried ginger. After stirring completely, I spread this out on 3 tefflex sheets and dehydrated them for about 36 hours at 105 degrees. Voila! Mix up your granola with any nuts, seeds or dried fruit you have on hand. Try pumpkin seeds, sunflower seeds and raisins too! Or pecans, walnuts and dried cherries. Or, omit the ginger. **How much sugar to water to put into your solution. It doesn’t really matter. Your fruit will ferment without any honey. The honey just speeds up the process. I started with 2 tablespoons in about 1/2 cup water. I added it to my gallon+ of fruit salad. It worked great.